According to a new report, Apple's new CEO Tim Cook faces the challenge of advancing the company's plans for digital video, even as it is developing "new technology" for delivering video to televisions. The Wall Street Journal has claimed that, according to people familiar with the matter, "Apple is working on new technology to deliver video to televisions," adding that the company has also been in talks over a subscription TV service. The report suggested that new markets, such as digital video and control of the living room, will pose the first "real test" for Cook, who officially took over for Steve Jobs on Wednesday. Markets that Apple is already entrenched in, such as mobile phones and tablets, have already been handed to him by Jobs and won't require the same level of innovation. Though further details regarding the rumored new technology were lacking, some have connected the comments to Apple's upcoming AirPlay Mirroring functionality, which is said to be iOS 5's "most exciting feature." AirPlay Mirroring could bring about significant disruption in the console gaming market by allowing iOS game developers to offer console-style gaming with the iPhone or iPad serving as both the hardware and a wireless controller. Speculation also turned to the possibility that Apple will release an Internet-connected TV in the near future. Analysts have claimed for years that the company is hard at work at an Apple-branded HDTV. Reports have picked up steam as of late, with some rumors suggesting that Apple could release the product as early as this fall. As for a subscription video service, Apple reportedly attempted to negotiate licenses for a service in 2009 but gave up after talks stalled. Envisioneering Group analyst Richard Doherty compared Apple's efforts to "pushing this giant marshmallow uphill," noting that convincing rights holders, cable and satellite companies to change their business models is "light years" tougher than with the music industry. 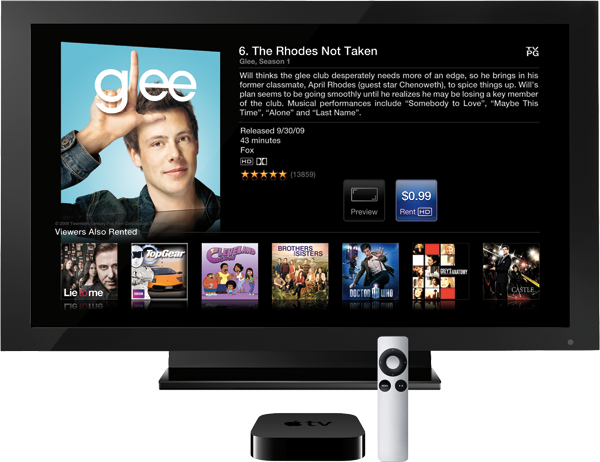 Apple has repeatedly referred to its Apple TV set top box as a "hobby." The most recent version, which sells for $99 and is focused on streaming content, has performed well, selling half a million units per quarter. 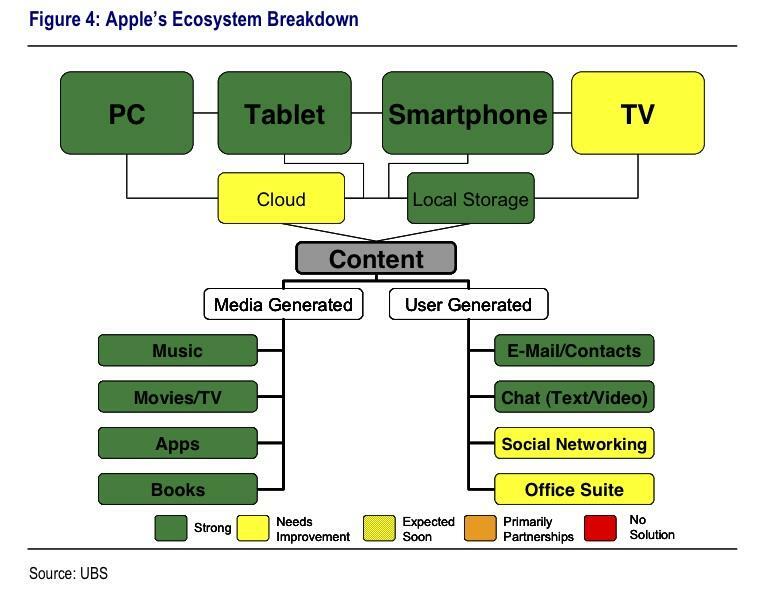 UBS Investment Research analyst Maynard UM has said that Apple is in the best position to win the battle for the "digital living room." He rated all areas in Apple's ecosystem as strong, with the exception of TV, the cloud, social networking and office suite, which were listed as "needs improvement." The company is expected to drastically improve its presence in the cloud with the introduction of iCloud this fall. Motley Fool Senior Technology Analyst Eric Bleeker also views Apple's opportunity to leverage iOS in the home entertainment arena as a next step for Cook. According to him, Jobs had already seen the vision of iOS extending into the living room, and it's up to his successor to execute it. "The main visionary aspect was accomplished, which was creating the mobile platform that now powers Apple and bringing the developers on," Bleeker said. "Once you had iTunes and iOS, less innovation was always needed, in a way, because of the momentum once you start moving forward." Rival Google is also making a play for the living room in the form of Google TV. However, the Android-based Apple TV competitor has failed to gain much traction. The Mountain View, Calif., search giant's recent $12.5 billion proposed acquisition of Motorola Mobility could help the company regroup. Motorola has an existing set-top box business that builds high-definition digital video recorders and other devices. The company also has a "Video Solutions" line of products for content sharing. For instance, its "Televation" product lets users rebroadcast live TV to other devices throughout their home. "They're a leading home device maker, and that's also a big opportunity," Google CEO Larry Page said of Motorola after the deal was announced. "We're working with them in the industry to really accelerate innovation."